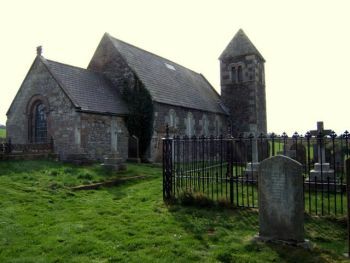 St Paul’s church in Branxton. Photo: Barbara Carr, CC-BY-SA-2.0, via Wikimedia Commons. The village of Branxton lies around 9 miles north-west of Wooler, and 3 miles from the Scottish border. In the 2001 census, its population was counted at 121, half the number it had been in the mid-19th century. It has become best-known for its adjacency to the site of the Battle of Flodden, which in early literature was sometimes called the Battle of Branxton. Little is known about the early history of settlements in the area, but the mediaeval village of Branxton was established by the 12th century and its parish church retains an arch from that period. The main recorded events before the 16th century relate to cross-border raids from Scotland. The manor of Branxton belonged to the Selby family who subsequently settled at Twizel. The Church of St Paul was originally constructed during the mediaeval period and could possibly stand on the site of an older timber construction. The earliest surviving part of the church is the Chancel Arch which dates from the 12th century. The church that one sees today was extensively rebuilt in 1849. Tradition says that after the Battle of Flodden it was used as a temporary mortuary and a burial place for a number of the casualties. 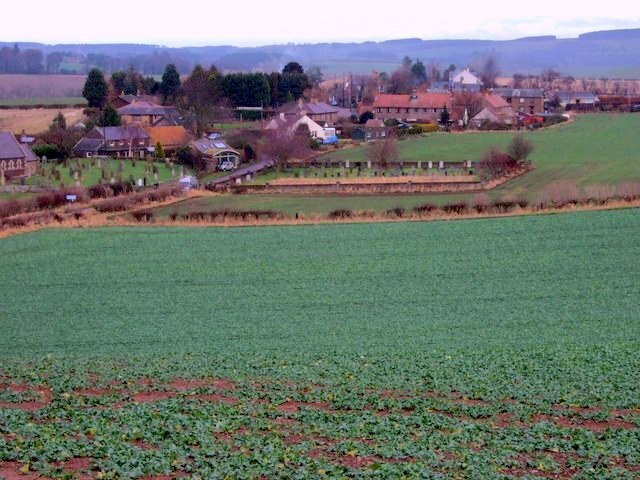 Branxton village and graveyard. Photo: Stanley Howe, CC-BY-SA-2.0, via Wikimedia Commons. The Battle of Flodden took place in the late afternoon of 9th September 1513. It arose from the shifting alliances and hostilities between the Papacy, Louis XII of France, and Henry VIII of England, which prompted the Scottish King James IV to initiate an invasion of English territory in order to draw away part of the English forces from the campaign in France. After capturing the castles of Norham, Ford and Etal, the Scottish army had taken up a position first on Flodden Ridge and then on Branxton Hill. An English force, led by the Earl of Surrey, moved into positions to their north and east. By nightfall the Scots had been decisively defeated. Many sources opt for a figure of around 10000 Scottish dead. These included King James IV, an archbishop and two bishops, and many other earls, lords and clan chiefs – the “flower of Scotland” . Numerous and varying accounts of the political background, the topography of the battlefield, and the phases of the fighting have been given – in books and documentary films, and now in some notable websites. Remembering Flodden has maps, a timeline, an online tour of the battlefield, and an ongoing Flodden muster roll. It is maintained by a locally-based charity to promote the site of the battle and its history. Flodden 1513 supports the Flodden 1513 Ecomuseum, a project which draws together twelve sites in the Borders which are closely connected with the history of Flodden, with plans to extend it to other sites further afield. 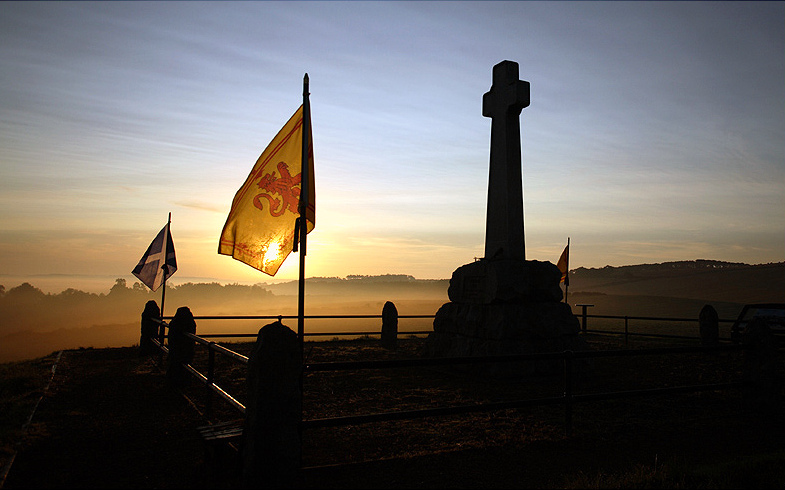 UK Battlefields Resource Centre: Battle of Flodden has an account of the battle, with plans and numerous photographs of the site. On the site of the battlefield stands a memorial in the form of a granite cross, with raised roll-moulded edges, on a base of massive roughly-dressed stone. A bronze plaque is set into the base, inscribed: Battle of Flodden / 1513 / TO THE DEAD OF BOTH NATIONS / Erected 1910. This photograph was taken at sunrise on 9th September 2006. © Dougie Johnston: www.galawater.co.uk. DRINK. WEARY. PILGRIM. DRINK. AND. PRAY. FOR. THE. KIND. SOUL. OF. SYBIL. GREY. And broke her font of stone. This drawing of the “Flodden Well” was made by Lady Waterford in 1862. Reproduced in: Augustus J.C. Hare, The Story of Two Noble Lives, being Memorials of Charlotte, Countess Canning, and Louise, Marchioness of Waterford. London: George Allen, 1893. Vol.3, p.140. It remains unclear whether Scott’s description had any basis in history or tradition (though the Greys of Milfield were a well-known local family), and what can be seen at both sites today was constructed in later periods. There is no sign of there ever having been a cross. 2. The Branxton well is close to the church, on the narrow road from the village to the A697. A well in this location is attested in local place-names far back into the 19th century at least, but it was reported that in 1911 there was only a simple trough below the spring. In 1912 plans were made to build a fountain here, to commemorate Sybil’s Well at a more appropriate site than Lady Waterford’s. Permission was obtained from John C. Collingwood, the proprietor of the land, and an appeal was launched to raise £100 to pay for it. It is unclear what the outcome of this venture was. The well as it is seen today probably dates from around 1935 and was undertaken by Colonel Gerard Leather (who wrote “New Light on Floddon”), with the work carried out by the building firm of Pattersons in Branxton. The face of the monument, which is now quite worn, carries the outline of a cross and the inscription (“Drink, weary pilgrim, Drink and pray” etc.) quoted accurately from Scott. A notable figure who emanated from Branxton was Percival Stockdale, an 18th century writer and clergyman, who achieved some fame in his time for his character and for his literary publications on poetry, although he is little remembered today. He was born in 1736, during the incumbency of his father as vicar of Branxton, and in later life he always remembered a remark made to him about his native village by his father: “You may make that place remarkable for your birth, – if you take care of yourself”. He was educated first at Alnwick and then in Berwick, before attending St Andrews University. Financial straits however obliged him initially to consider a military career. After becoming ordained, Stockdale settled in London for a time and got to know many of the leading literary figures of the time including Samuel Johnson, with whom he eventually fell out over the latter’s Lives of the English Poets (but not before he had composed “An Elegy on the Death of Dr Johnson’s Favourite Cat”). He also wrote “a rhyming history of the battle of Flodden”. In addition to his literary works, Stockdale wrote a number of social tracts including one deploring bull-baiting and the ill-treatment of animals, and several pieces on the evils of the slave trade. In 1783, he obtained the vicarage of Lesbury in Northumberland where he spent much of his later life. He died in 1811 and was buried at Cornhill-on-Tweed. He had published his Memoirs in 1809 and they did little to favour his subsequent reputation; Sir Walter Scott delivered a crushing judgment on them: “This extraordinary effusion of egotism and vanity should be read by all who are visited by the folly of thinking highly of their own productions.” He did however receive an extensive and sympathetic obituary notice in The Gentleman’s Magazine (vol.110, p.384) which recorded the immense variety of his interests and accomplishments. Samuel Lewis. A Topographical Dictionary of England. London: S. Lewis & Company, 1831. Norman A. Curry. A Tale of Two Wells. Typescript: deposited in Berwick Record Office 2001. B.R.O. 912/2. “Sybil’s Well at Flodden”. Berwick Journal, 2 May 1912, p.4. Percival Stockdale. Memoirs of his Life and Writings. London: 1809. 2 volumes. Arthur Sherbo, ‘Stockdale, Percival (1736–1811)’, Oxford Dictionary of National Biography, Oxford University Press, 2004. www.oxforddnb.com/view/article/26543 [accessed 25 Aug 2013]. And: Dictionary of National Biography, 1897.